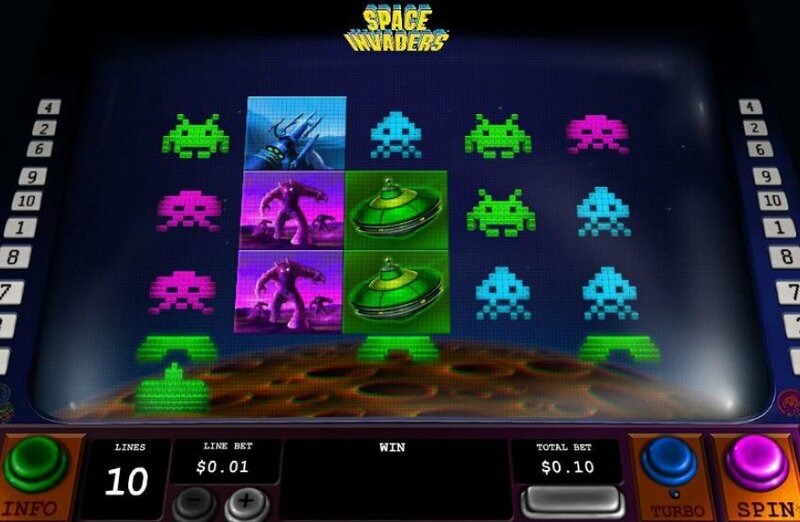 Space Invaders slot machine is based on the original arcade game that became such a huge hits among gamer’s in the late 1970’s. The game captures the theme fantastically well as it basically takes place in a recreated arcade machine which houses the 5 reels and 10 paylines. The game plays pretty simply, and only has a max jackpot of 100x, but where it comes to life is with the 2 bonus rounds. Keep reading for the full Space Invaders slot review below. If you fondly remember the classic 1970s shooter from the video arcades of your childhood, you’ll love Playtech slots’ five-reel, ten-payline reboot of Tomohiro Nishikado’s iconic title, the Space Invaders slot. Featuring a range of pixelated symbols that will be instantly recognisable to anyone who’s played the game, the Space Invaders slot machine retains all the retro charm of Taito’s original machine right down to its background, which sees the reels appear on an actual arcade cabinet complete with plastic buttons. Playable from as little as £0.10 per spin across all desktop, mobile and tablet devices, Space Invaders features the original game’s iconic cannon on its reels, with this symbol triggering one of two bonus effects during base game spins. A regular jackpot of 150x their line bet helps keep players’ bankrolls ticking over nicely, while a simple pick-up-and-play interface makes it a great game for slot novices. As mentioned above, the two bonus features in Space Invaders are both triggered by the cannon that sits below the base game reels. During each spin, the cannon will come to a stop beneath a random reel; should it stop on reels one, three of five, it will be positioned behind a shield and unable to fire, but should it stop on reels two or four it will blast any invaders into substitute wilds. The cannon is also responsible for the randomly-triggered UFO Wild bonus, which can occur after any regular base game spin. When this happens, the cannon will fire a powerful laser at a UFO that appears above the reels, with this causing the flying saucer to drop up to nine wilds onto the reels as a free re-spin potentially creates some huge payline combinations and intergalactic prize payouts. Aside from these two features, Space Invaders is an exceptionally straightforward title to play, meaning the slot combines all the arcade appeal of the original game with the potential for big wins. Playtech have done a great job in bringing an iconic arcade game back to life in their Space Invaders slot, which combines retro nostalgia with modern to features to create a memorable mobile casinos experience. Like the Space Invaders slot review? Check out these as well…..